North Korean leader Kim Jong Un, in a file photo, and President Donald Trump. 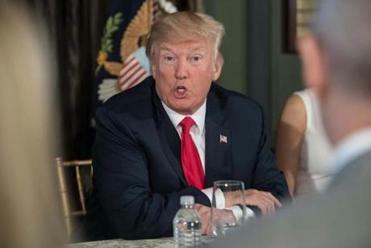 President Trump’s reckless words directed at North Korea on Tuesday risk inflaming one of the world’s worst headaches. Speaking at his golf club in New Jersey, Trump said: “North Korea best not make any more threats to the United States. . . . They will be met with the fire and fury and frankly power, the likes of which this world has never seen before.” Left unclear was whether the president was demanding a halt to the North’s nuclear program, or simply an end to the stream of hyperbolic threats Pyongyang is known for. It would understate Trump’s rhetoric to call it saber-rattling, and it would defy all past experience to imagine his tirade will persuade North Korea to change course. On the contrary, Trump’s words risk spooking American allies in the region and undermining recent steps toward stopping the North’s nuclear program. 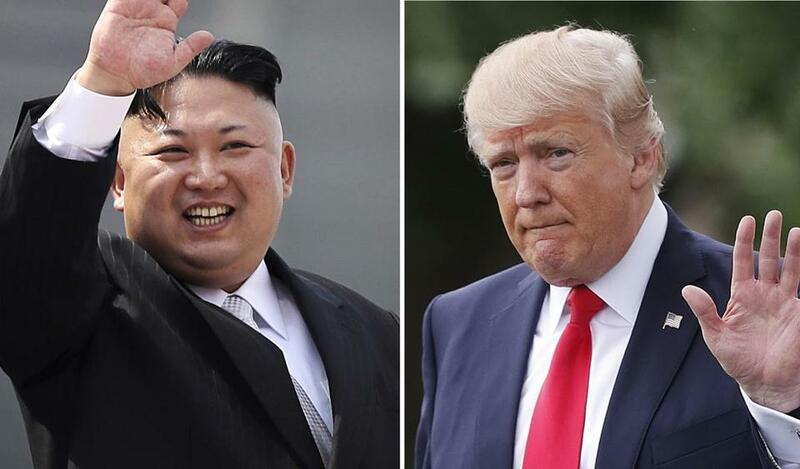 Trump’s invective came after news reports that the North’s dictatorial regime may have passed a milestone in its long quest to become a nuclear power. One US intelligence agency concluded that the North has successfully built a nuclear weapon small enough to fit on its intercontinental ballistic missiles. If true, that would mean North Korea is closing in on the capacity to reach the mainland United States with a nuclear weapon. One intelligence assessment doesn’t make the North’s nuclear progress a settled fact, though, and the world still has options short of “fire and fury.” The United Nations just passed new sanctions against North Korea. Ideally the United States should be spearheading renewed diplomatic efforts to constrain the North’s nuclear program (not that the State Department is fully staffed yet, but that’s another story). By explicitly threatening military action — and, implicitly, nuclear attack — Trump instead pushes US policy in an ominous direction. First, he has essentially set out a red line. If North Korea continues its nuclear program, as it almost certainly will, Trump will be faced with the choice of either starting a war or abandoning US credibility. Both options are bad; one is catastrophic. American foreign policy since World War II has included the unspoken threat of preemptive nuclear attack against adversaries. But for good reason, presidents have left America’s threshold ambiguous, a policy Trump seems to have discarded on a whim. North Korea fired off its own ‘‘serious warning’’ about ‘‘enveloping’’ the US territory of Guam in missile fire. Second, by talking so cavalierly about military action, Trump risks provoking a North Korean attack, which would have lethal consequences for South Koreans and for American service members stationed on the peninsula. If the North Korean regime concludes that Trump is serious, it may not wait to be attacked but could lash out preemptively at millions of South Korean civilians and thousands of American soldiers. Finally, even for an administration that has discarded so many long-established norms of civility in American politics, it’s important to take note of the dark implications of Trump’s latest outburst. American presidents have unleashed violence before, but they don’t normally revel in it, or boast in such crude terms of the havoc that the United States can inflict. The world — and especially East Asia — fully understands the capabilities of the American military. But such preening rhetoric threatens trust, built up over decades, that America is committed to using that power wisely, responsibly, and only as a last resort.